Nitrofurans are a class of synthetic antibiotics. The use of nitrofurans for edible animal and fishery products is banned in many countries. The chromatogram below shows the recovery of nitrofuran metabolites from fish using the LCMS-8045. 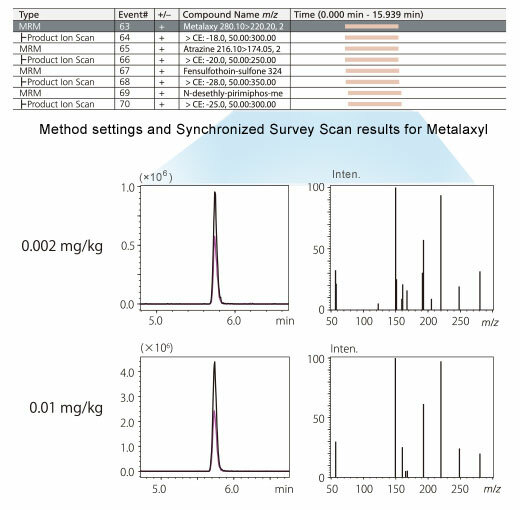 Excellent linearity and accurate quantitative results ranging from 0.05 to 20 ng/mL were obtained. 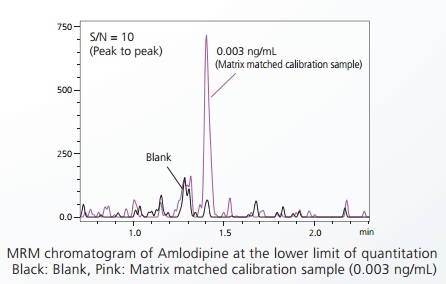 The LCMS-8045 is shown to be an excellent platform for routine high-sensitivity analysis in challenging matrices. *Limit of detection (LOD) was calculated at signal-to-noise ratio (S/N) = 3. Regulatory agencies worldwide provide oversight for an extensive and ever-increasing list of pesticides in order to promote food safety and protect public health. The MRM chromatogram below shows the simultaneous analysis of 153 pesticides spiked into Codonopsis pilosula at 0.01 mg/kg. Plant matrices can be very challenging due to background interferences, but the LCMS-8045 provides enough sensitivity to analyze most pesticides at the trace level of 10 parts per billion. Many pesticides methods also benefit from polarity switching, which the LCMS-8045 can accomplish in just 5 msec. Use Synchronized Survey Scan (SSS) to obtain both qualitative and quantitative information from a single injection. Full scan MS2 spectra will be obtained when an MRM peak intensity threshold is exceeded. Pharmaceutical and personal care products (PPCPs) encompass a family of compounds used by individuals for health and cosmetic purposes. As populations increase, and the use of these products increases, PPCPs will become a significant threat to our water supply. The LCMS-8045 is capable of trace-level quantitation of many PPCPs without extensive sample preparation. Limit of quantitation (LOQ) was calculated at S/N = 10. Amlodipine is widely utilized for the treatment of high blood pressure and angina. 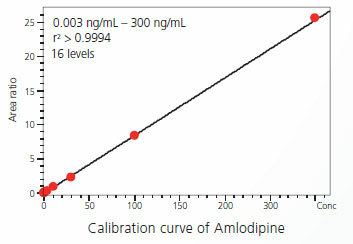 A high-sensitivity method for the quantitation of amlodipine in human plasma using LCMS-8045 has been developed. Appropriate linearity ranging from 0.03 to 300 ng/mL with excellent accuracy was achieved. Both interday and intraday variabilities were assessed for quality control samples. Percent RSD (Relative Standard Deviation) results were less than 5%.